Each workday, Chicago’s commuter railroads transport over 200,000 people, safely and without incident. This is one day it didn’t happen that way. The story takes place on the line now known as the Metra Electric. At approximately 7:25 a.m., northbound Illinois Central train #416 overshot the 27th Street station. The train was made up of four new, double-deck, lightweight cars. The engineer stopped the train and began backing up. Three minutes behind, train #720 was moving down the tracks at 40 mph. 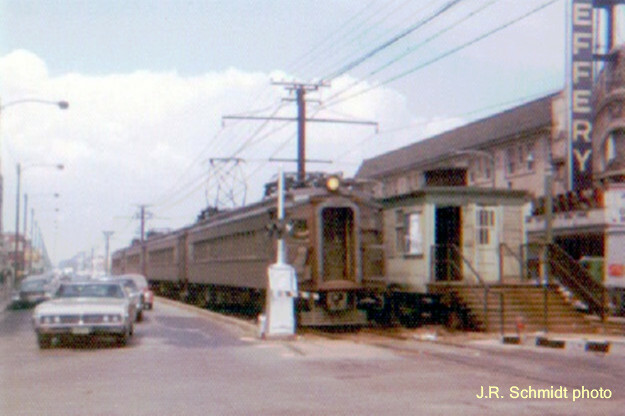 This was an express, with six older, single-level cars of heavy steel. When the first train passed the station, it had tripped a block signal, indicating that the track was clear. Coming through the morning fog, the engineer of #720 saw the leading train too late. The front car of #720 slammed into the rear of #416, and smashed straight through, before grinding to a halt on the tracks. People screamed. Those who could scrambled for exits doors. But in the two telescoped cars, the passengers were caught in a tangled, mangled mess. By coincidence, the accident occurred less than a hundred yards from Michael Reese Hospital, and within a few blocks of Mercy Hospital. Medical personnel from both facilities rushed to the scene. Alerted by extra alarms, the first wave of 240 firemen arrived. They began rescuing trapped people from the wreckage – and removing the bodies of the dead. By early afternoon, rescue operations were completed. An “outdoor hospital” had been set up on the station platform, to evaluate injuries and set priorities for treatment. Dozens of ambulances and police squadrols – and two helicopters – were used to transport the victims to seven hospitals. Since the Illinois Central was an electric railroad, there had been no fire – which may have been the only positive thing about the accident. Trains #416 and #720 had carried a combined total of about 1,000 passengers. Of that number, about 350 were injured. The final death toll was 45. Mayor Richard J. Daley, who lived nearby and was an early visitor to the scene, ordered the city’s flags to be flown at half-mast. 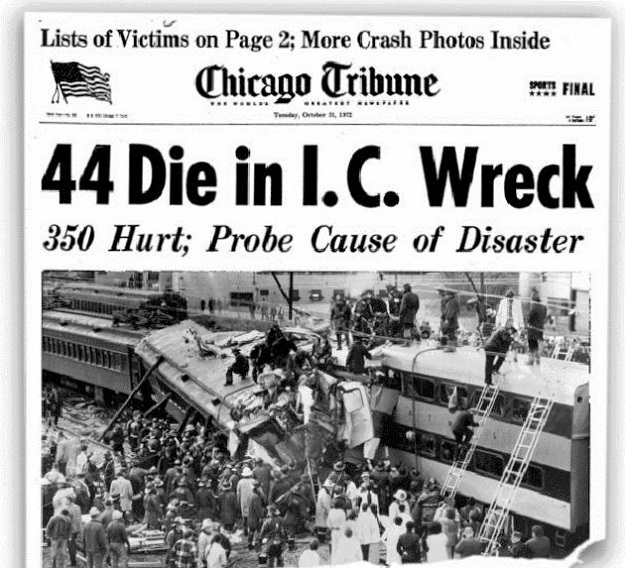 The 1972 accident was the deadliest train wreck in the city’s history. As a result of the tragedy, the rears of all Chicago commuter cars are now painted in high-visibility orange.